We just started getting errors in our existing integration indicating that the SSL Certificate is not trusted. Hey Sean, sorry about that. We recently changed webservers from Apache to Nginx. To us it looked like things were working properly, but maybe not? 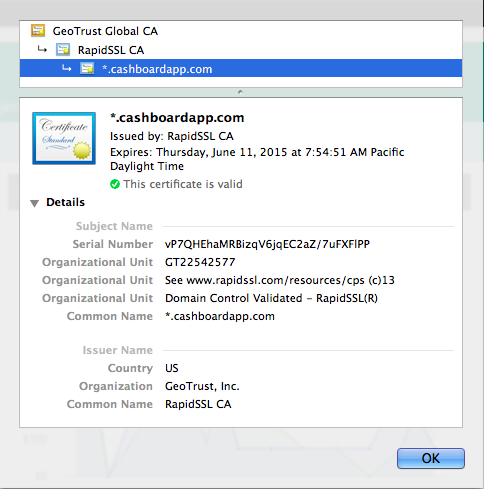 Anyhow, we tweaked the SSL certificate to include the chained RapidSSL bundle. Give it another try and let us know if the error went away? Perhaps try installing the RapidSSL CA cert bundle on your server. I'm out of ideas here, and it seems to be working on browsers and elsewhere so far. I will keep my eye on this to see if any other customers mention it. I think there are still issues with the certification chaining. I'm seeing issues with the intermediate certificate. rapidssl.com/resources/cps (c)13/OU=Domain Control Validated - RapidSSL(R)/CN=*. Same issue with looking at the certification on GeoTrust. Just checked the URL you provided, looks to be working now. Please confirm. Yahoo! Everything seems to be working now. Thank you for your help. This comment was split into a new discussion: SSL Certificate expired? Did the cert expire? Our calls from Salesforce to Cashboard are failing due to cert issues. It looks like the cert expired on the 27th of June. No. Our certificate expires June 11 of next year. Also - Sean RE your other thread...this is the last time we actually changed anything with the certificate. Seth B closed this discussion on 30 Jun, 2014 07:14 PM.